Funny story, a little over a week ago I went out to dinner with a good group of friends. One of them was telling me that he is trying to get into Scotch and recently found himself at a liquor store trying to decide what to start with. His philosophy during that time was to buy the brand featuring the biggest antlers. This certainly made me laugh and reminded me that the reason I started this blog was for my friends who didn’t know much about whisky and wanted to start enjoying it. The upside to my friend’s story was that he actually ended up liking the Scotch he purchased, the one with the big antlers, however the big antler philosophy won’t always work when selecting scotches. In case he does need another big antler suggestion, Dalmore (the bottle is adorned with beautiful royal stag antlers) and its 18 year-old scotch would be a great choice. This Highland distillery has been producing whisky since 1893. The Distillery was owned by the Clan MacKenzie for almost a century. It is their family crest that you see nicely adorned in their bottles. My first introduction to Dalmore was with their 12 year-old scotch (http://wp.me/p3Zt2k-B). I found the 12 year-old to be one of the sweetest scotches I have ever tasted and think it’s an after dinner scotch. 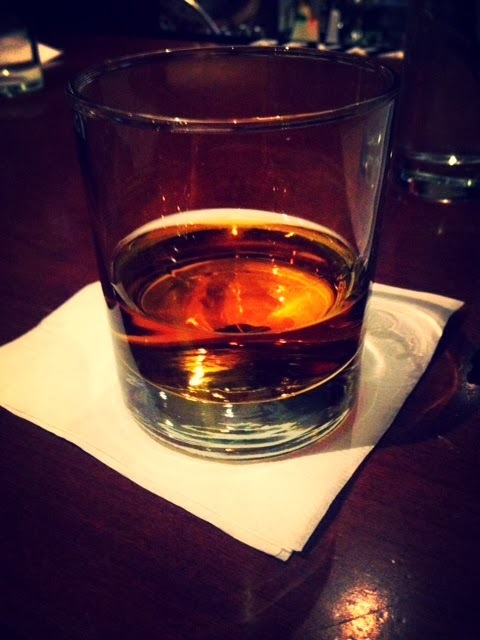 Like the 12 year-old, the 18 year-old Dalmore is sweet and I too think it should be enjoyed after dinner. I see it as a great dessert scotch. The 18 year-old is matured in American oak (ex-bourbon) casks for 14 years. Its last four years are spent in 30 year-old Matusalem oloroso sherry wood casks. Aside from the tastes being slightly different, the 18 year-old is definitely more expensive at around $140-$165, depending on where you buy, while the 12 was priced around $40-$50+. I very much enjoyed the 18 year-old but if you were to ask me which one of these two years I preferred, I would tell you the 12 year-old. That is the same answer you would get from me even if price were not a factor. If price is a factor for anyone, as it would be for me, you really can’t go wrong with the 12 year-old, however if you get the chance to try this 18 year-old, then I recommend you do. The 18 year-old has an edge to it and it’s certainly on the spicier side. You can definitely tell how much more grown up it is from its younger 12 year-old sibling. I was please to see the differences and the similarities between the two. It is a scotch I would recommend trying. If you are out for dessert and need a scotch recommendation, both the 12 and the 18 would be a great choice, plus the bottle does have antlers. Dalmore Die-hard here. Cigar Malt is my kryptonite! Great Review! Thank you! Dalmore does make pretty darn good Scotch. I will now need to try out the Cigar Malt.